This was taken at the mountain TT to Avoriaz (Morzine), in the 1994 Tour. 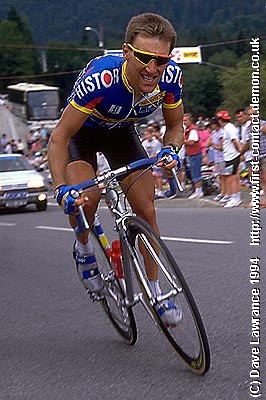 It was French favourite Charlie Mottet's final tour before retirement, and he was giving his all for the home fans, who responded with a massive cheer as he came round the corner. Though he was fairly well down on GC, he led this TT for a while until the top men started coming in.